Local SEO enables your website to leap to the top of Google’s organic search results. This can be achieved without long search engine optimisation – though that depends on how competitive your market is. Notice the image to the right – is there any better way to stand out in the crowded organic search results? You need to be on the first page – 75% of searchers never go past the first page. Being in the top three has never been more important for your business due to increased mobile usage. 3 How Long Does Local SEO Take? Google Local Listings are displayed in towns and cities when a user searches on Google and Google believes there are local businesses that are suitable results for that search term. If you are a local business serving a town, village, or city being listed in local is a great way to appear prominently at the top of Google. The local pack now lists only three companies, in the past, it listed up to seven – more reason to make sure you are one of the three. The listing includes review stars, address, telephone number, opening times, a map listing, and directions to your business. 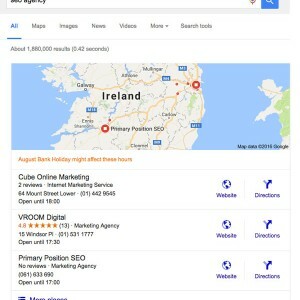 A search for SEO Agency, if you are in Dublin, and sometimes throughout Ireland resulted in the image at the top right of this page. Try it and see: search for plumber, accountant, cycle shop, any local business service or product. Google business listing is the starting point for any local search SEO listing. Being listed with Google is a must. We will optimise your Google listing or give you the instructions. There are a few changes that will be needed on your website. They are small, part of the code, and necessary. Some keywords can show almost immediately, but for more competitive search terms expect between 3 and 8 months. Our work is spread over three months. From past testing, off-site citations and links are counted quicker if spread over time rather than bulk submissions. The cost is from €495 per month for at least three months – if you are working in a competitive niche link building will be required for longer. Cost depends on your current website, competition, and location. Special care is required when submitting more than one address to Google. Done right this can be a great opportunity for national businesses to rank quickly and easily everywhere they have an office, shop, or store. However, Google appears to be very strict with multiple location submissions and they do take the time to check that every location exists and what the main business carried on at that location. If you have changed address, telephone number, domain name, or company name it is worthwhile cleaning up your local SEO listings. It is more time consuming to change local citations, therefore each contract is quoted individually.